Good Morning and Happy Saturday Everyone! We continue to pray over everyone here in Houston and surrounding cities and all those being affected by Hurricane Harvey. Our prayers go out to all those in Rockport and Corpus ❤️ We pray for safety and comfort from our Heavenly Father over each and every one of you. This morning I wanted to take some time to just sit with God and just meditate on his word amidst the storm all around us. As I read this passage I could hear God’s sweet whisper of Hope. 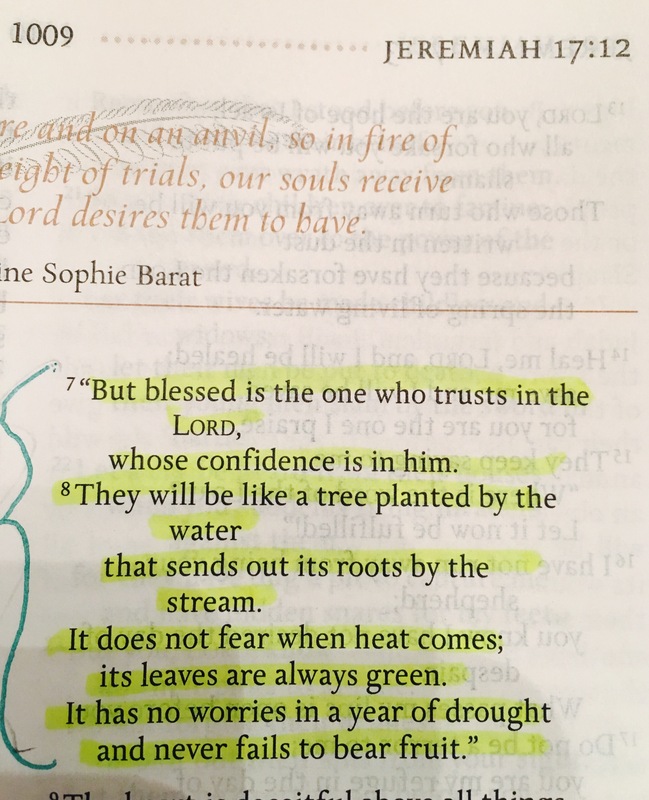 As we trust in Him during this storm we become just as the tree mentioned here. Our roots are firm in the ground of faith. We drink from the water that seeps in from below. We drink from His truth. We aren’t afraid of heavy winds or heat. We continue growing because our faith and hope is so firmly rooted in God. My sweet friends, as the storms pass through in your life, be rooted in God. Notice how I said, “as the storms pass”. We know this storm Texas is facing today plans to linger a few days causing damage. But it too will eventually calm down and pass. The same goes for the storms in our lives. Those storms will feel heavy and unbearable but know my dear friend that it too shall pass. The storm you are going through may linger for a bit but it will pass. Trust in God for strength to endure. Keep bearing your fruit and allowing your leaves to grow. Be like that tree so deeply rooted in your faith and hope in God. Spend this time in a state of gratitude for God’s sweet mercy and divine protection. Heavenly Father we thank you this morning for your divine protection over us. We thank you Father that despite the heavy storms brewing all around, we trust that You will see us through it all. You are our strength. Our comfort. I thank you Father for the peace that you have covered us in. As we put all our faith and hope in you my Lord. We love you and thank you as you continue to comfort us during the storm we are facing today. In Jesus name we pray. AMEN!